mon petit lyons: Farewell, 2012! 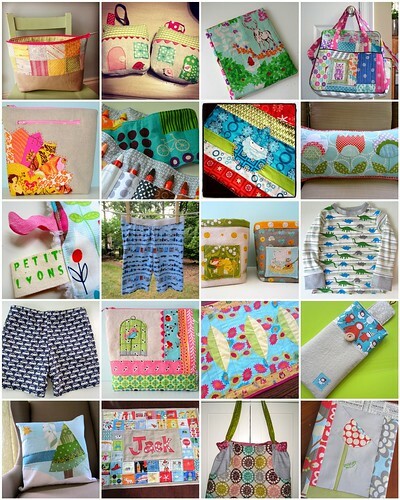 I thought I would put together a little compilation of my favorite sewing projects from the past year. Partly because I haven't sewn much at all this past week or so. I hope you have also had a lovely holiday enjoying the break from the normal routine and spending time with loved ones. It's been wonderful here and I think Wednesday morning is going to come as quite a shock as we go back to "normal" life! 2012 on the blog has been an awesome year, with lots of blog hops, swaps, classes and bees. It has been fun to make even more connections with my bloggy sewing world friends and contribute to so many fun events. I can't wait to see what is in store for 2013! 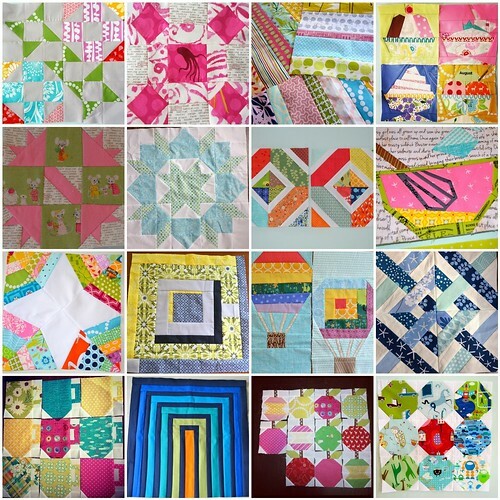 These are the quilts for 2013. There were more than I thought! The last one is not a finish, but since I actually managed to stay on schedule with my Super Penguin Quilt Along I added it in (plus it's hard to make a mosaic square with 8 pictures. These are all the random little projects scattered during the year. 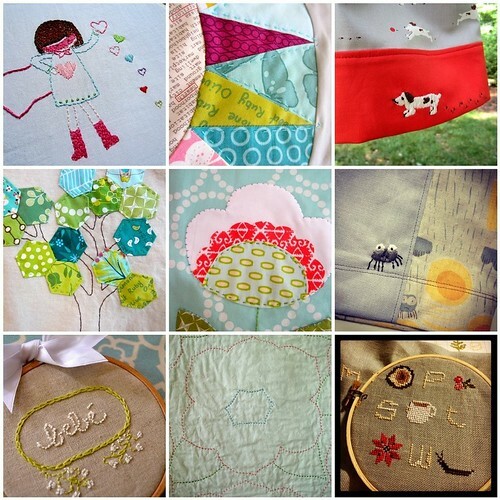 Lots of these are from swaps, sew alongs, classes and blog hops. Sometimes I need a little push to get going on something and I can always count on the bloggy sewing universe to give me that push! There was definitely more handstitching this year and I loved it! From hand stitching on quilts to the Hand Stitched Camp at Stitched in Color to samplers, there was definitely lots of hand work. It coincided well with Andrew traveling a lot less for work. Many nights of watching tv with him while I stitched away. Much preferable to being holed up in my sewing room alone (sometimes)! 1. Finish Farmer's Wife Quilt!! 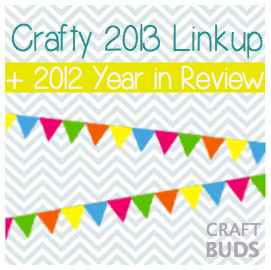 I am going to link up to the 2012 Year in Review Linky Party at Craft Buds. I hope you have a wonderful time ringing in the New Year tonight! Have fun, be safe! Much peace and love to you in 2013! So many stunning projects! Happy New Year! You've been a busy bee this year, well done! A wonderful Happy New Year to the very talented Courtney!!!! 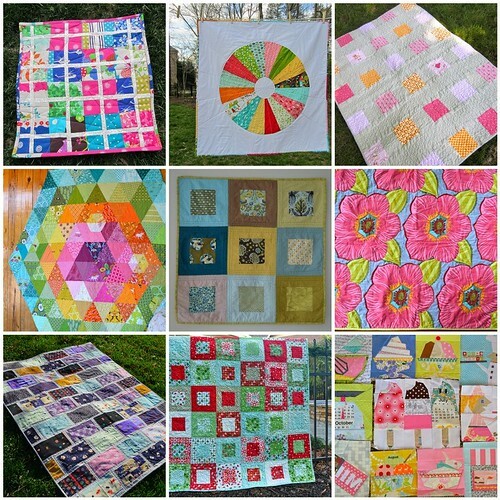 Very fresh projects this year--love the colors all together! Thanks for linking up at Craft Buds, and cheers to 2013!